Particularly useful for microservices, Spring Boot Admin allows you to administer and monitor multiple Spring Boot applications using a single dashboard. As part of microservices development, many of us are using Spring Boot along with Spring Cloud features. In the microservices world, we will have many Spring Boot applications running on both the same and different hosts. If we add Spring Actuator to the Spring Boot applications, we will get many out-of-the-box endpoints to monitor and interact with Spring Boot applications. The list is given below. The above endpoints provide a lot of insights about a Spring Boot application. But if you have many applications running, then monitoring each application by hitting the endpoints and inspecting the JSON response is a tedious process. To avoid this hassle, the Code Centric team came up with the Spring Boot Admin module, which will provide us an admin UI dashboard to administer Spring Boot applications. This module crunches the data from Actuator endpoints and provides insights about all the registered applications in a single dashboard. As a first step, create a Spring Boot application, which we will make as a Spring Boot Admin server module by adding the below maven dependencies. Add the Spring Boot Admin Server configuration by adding @EnableAdminServer to your configuration. Let us create more Spring Boot applications to monitor via the Spring Boot Admin server created in the above steps. All the Spring Boot applications created now will act as Spring Boot Admin clients. To make an application as an Admin client, add the following dependency along with the Actuator dependency. In this demo, I have created three applications — Eureka Server, Customer Service, and Order Service. Add the following property to the application.properties file. This property contains where the Spring Boot Admin server is running. Hence the clients will register with the server. Now, if we start the Admin Server and other Spring Boot applications, we can able to see all the admin clients information in the Admin server dashboard. As we started our admin server on port 1111 in this example, we can see the dashboard at http ://<host_name>:1111. 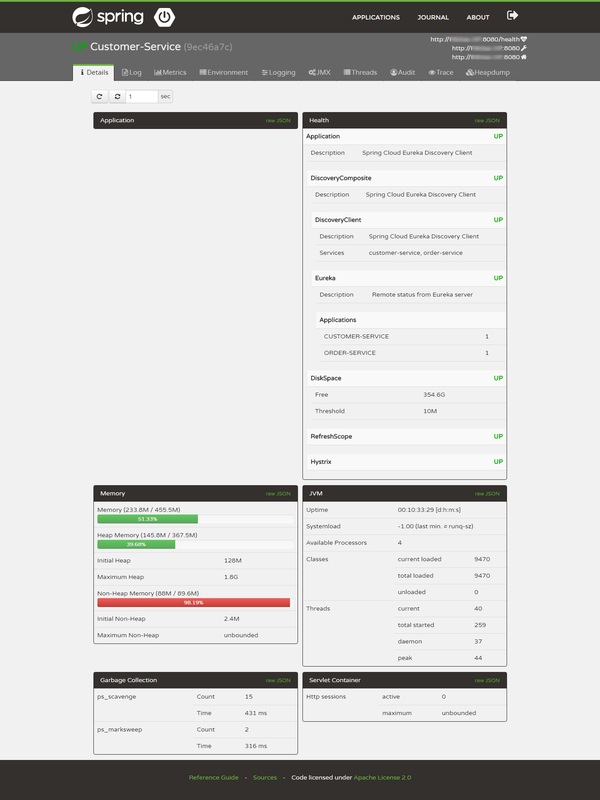 Below is the screenshot of the Admin Server UI. A more detailed view of an application is given below. In this view, we can see the tail of the log file, metrics, environment variables, and log configuration, and we can dynamically switch the log levels at the component level, root level, or package level. Now we will see another feature called notifications from Spring Boot Admin. This will notify the administrators when the application status is DOWN or the application status is coming UP. Spring Boot Admin supports the following channels to notify the user. In this article, we will configure Slack notifications. Add the following properties to the Spring Boot Admin Server’s application.properties file. With Spring Boot Admin, we are managing all the applications, so we need to secure the Spring Boot Admin UI with a login feature. Let's enable the login feature for the Spring Boot Admin server. Here, I am going with basic authentication. Add the following maven dependencies to the Admin Server module. Add the follow properties to the application.properties file. As we added security to the Admin Server, Admin clients should be able to connect to the server by authenticating. So, add the following properties to the Admin client’s application.properties files. There are additional UI features like Hystrix and Turbine UI that we can enable for the dashboard. You can find more details here. The sample code created for this demonstration is available on GitHub.